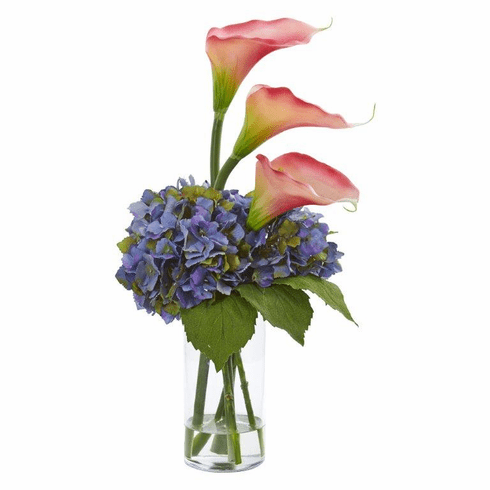 You will definitely create interest and draw people's attention with this lovely 18-inch artificial calla llly and hydrangea arrangement. It has fresh looking petals that blend seamlessly into the green leaves and long stems, all nestled in a simple clear vase. This arrangement will bring a pop of color to your dining or living room table when placed as a centerpiece together with bright vases and glassware. Size: Height: 18 In. Width: 10 In. Depth: 10 In. Pot Size: H: 7.5 In. W: 3.5 In. D: 3.5 In.